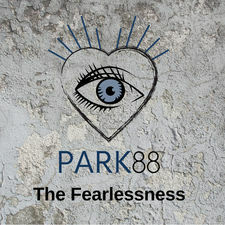 PARK88 is the duo RICH WYMAN (vocals, piano) and LISA NEEDHAM (vocals) and this is their debut, the CD EP “The fearlessness”. It contains six songs of melodic rock with some r’n’b vibes. If you imagine a mix between R.E.M. and HUEY LEWIS & THE NEWS, that’s approximately what we get here. More of the latter influence in “Good times”, and more of the former in “The fearlessness”. Both Rich and Lisa have great voices and the production is warm and professional. Two of the songs are also included in other versions as two bonus tracks. This CD makes me happy!